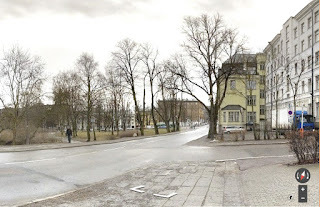 The June 2015 location for the Virtual Paintout was Estonia, an exciting and beautiful place to look around, virtually. 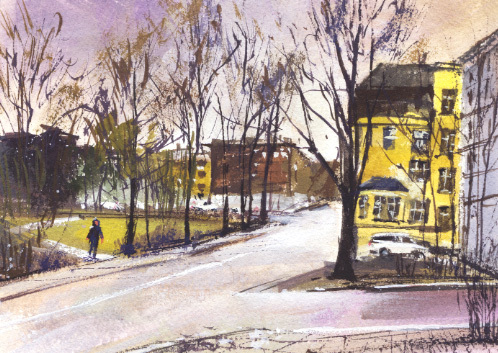 Bill Guffey hosts the monthly Virtual Paintout and chooses the locations. He posts our artwork on Facebook and his blog. The location can be anywhere the Google Street View vehicles have travelled. 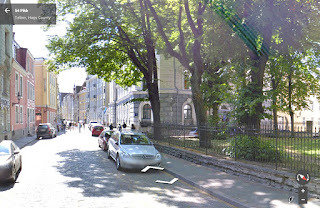 Estonia is in Northern Europe in the Baltic region. The "old Town" section of Tallinn was very charming with many classic buildings. I found one rocky-looking beach with lots of people but thought it might look like many places. I try to find something more descriptive of the country we're visiting. What will the July location be? 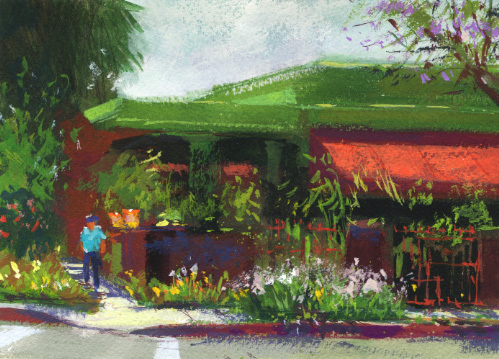 I've been able to paint at a few local plant nurseries and it's always a fun experience. I see it's been almost a year since I painted A Nursery! so I was happy to have another nursery paint-out opportunity. This time we were in San Marino at Mission Nursery. Although it's been on its corner for many years, it's still sort of a hidden treasure. A lot of plants and color are packed into the relatively small space. It's a lovely getaway just to browse. Because I didn't want to block any aisles with my painting equipment I chose a view from across the street. I loved the bright green of the building and red of the awning. 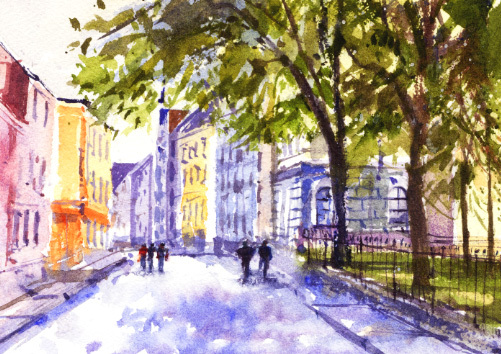 Since the group enjoyed painting there, it's on our schedule again. Next time I'll probably be squeezed in an aisle. 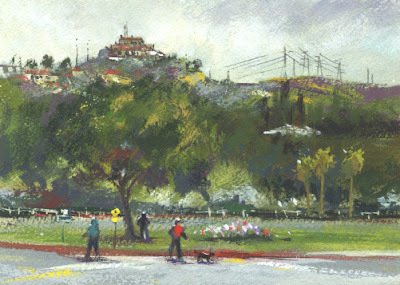 A recent paint-out was at Oak Grove Park in Pasadena which is now named Hahamongna Watershed Park. My first time to paint there was two years ago and I posted that watercolor in JPL View! On that visit we painted down in the "spreading basin" and I chose the view of JPL. This time everyone was painting from the main park road near the parking area so I stayed there too. I still had a view of some of JPL but the bright yellow wild mustard flowers caught the eye of several of us. 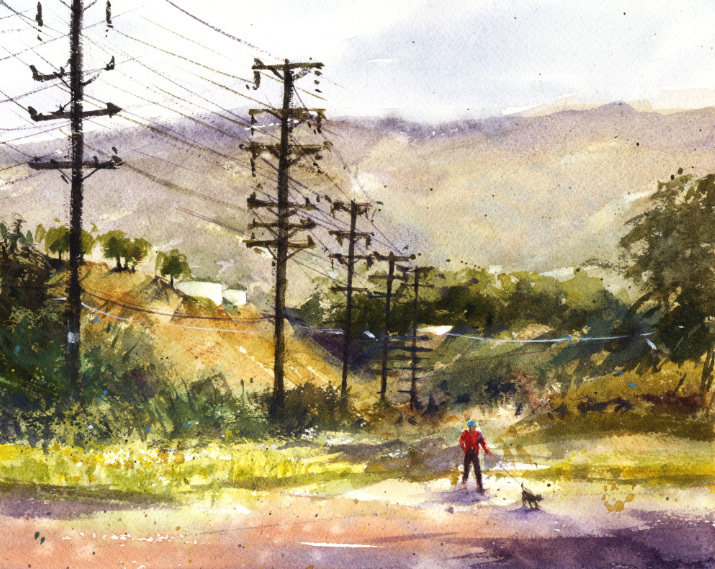 I also liked the utility poles all in a row, and I ended up leaving JPL out of my painting. This area has great views of the San Gabriel Mountains with their ever-changing colors and values. We were taking some risks since the Oak Grove Disc (Frisbee) Golf Course is there too. Some trees we were painting under were between two course holes so we heard "Watch Out!" occasionally. There are always dog walkers as well, so it must be a very busy spot on a weekend. There is a lot to paint there and I'm looking forward to next time. It seems that I'm traveling south along the Arroyo Seco Flood Control Channel from where my previous post was painted, Another Hillside. 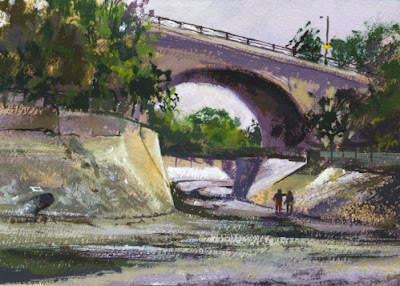 I painted this gouache piece with the L.A. River group in South Pasadena about 4 miles south of the hillside. I was lucky that it was another overcast day since I wanted to try this York Blvd. bridge and there wasn't a good view from under the trees which overhang the channel. To me it feels a little strange being down in the cement area of the channel. There is a ramp down to the channel from the street level at this location. The ramp seems to be busy with cyclists and city trucks. There are always dog walkers there too. The city trucks were there on our paint-out day spraying for mosquitos, finishing up before we started painting. As the sun started coming out around noon, the light and dark patterns on the bridge and channel walls got more interesting. Overcast earlier with no sun or shadows. In my previous post, we were painting Near the Rose Bowl. Just a few feet away is the Arroyo Seco Flood Control Channel. It seems like I've been painting near flood control channels frequently since going out with the L.A. River paint-out group and, as always, our adventurous Saturday plein air group. So on a recent Saturday, about two miles south of the Rose Bowl Stadium, the group met next to the channel because we've found the pretty Matilija poppies there. The poppies were blooming out in the sun where they like to grow. Unfortunately, I don't like to paint in the direct sun. There was one, lone tree next to the channel which we all painted under. And we chose other views to paint rather than the poppies. I chose the hillside opposite the tree. 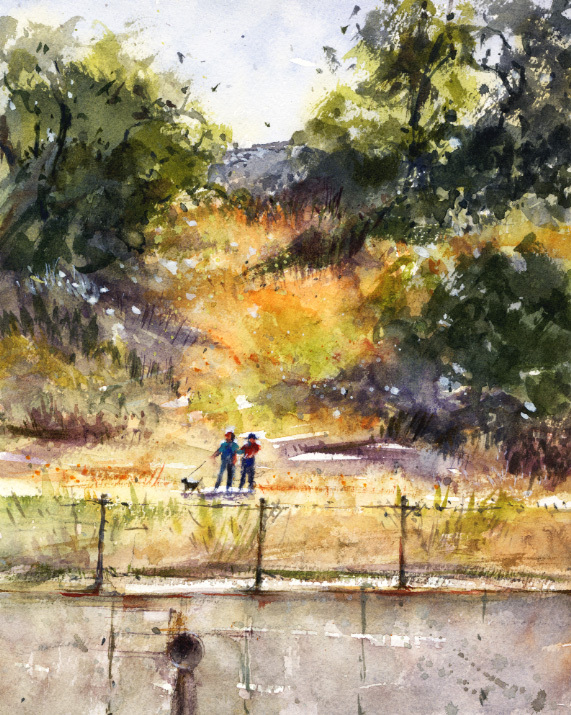 Dog walkers were a constant sight and it was fun to add some. There wasn't a drain in the channel walls at that point so I had to find another drain that I felt my painting needed. The one I found had a sweet little cat napping under it. I hoped she has a better home than the channel. The month of June in Southern California usually has overcast mornings, known as "June Gloom". Because of this I thought I might start June with a bright, colorful painting! A recent Saturday paint-out was at Chinatown. I've painted there quite a few times now and posted my previous watercolor in Busy Chinatown. I always enjoy my visits there and have many childhood memories of how it "used to be". There have been many changes over the years of course, but Chinatown still retains its special character and ambiance. I just love the dragon roofs and especially the distinctive pink building. 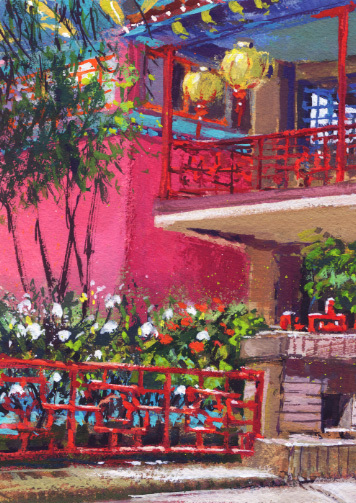 It's next to a lovely meditation pond with a bright aqua tiled bottom, surrounded by wonderful bright red railings. There also were some shiny gold lanterns decorating a balcony above. I gave this scene a try in gouache, and some sun peeked out about noon.